Yesterday, SearchDataBackup.com Site Editor Andrew Burton and I took a trip to Iron Mountain Digital’s headquarters in Southborough, Mass., for some face-to-face meetings with Iron Mountain Digital’s executives. Those execs had plenty to tell us about Iron Mountain Digital’s plans for the rest of this year, and for some of 2010, including a project codenamed “Gryphon” that will add data classification capabilities for eDiscovery into the next release of Connected PC Backup. 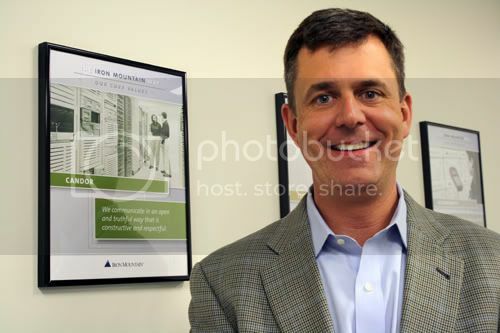 Andrew Burton sets up for a video Q&A with Iron Mountain Digital Vice President David Kubick. Note the “Stairway to Heaven” poster behind Kubick–Iron Mountain’s Southborough conference rooms are named for rock bands. Digital Archiving product marketing manager Claire Lima, who explained to us (see whiteboard) that IMD users with a legal matter can have Iron Mountain feed data from other repositories into Stratify for legal review and production, or if they’re overshooting backup windows with LiveVault. The goal is to have more automated integration between eDiscovery, backup and archiving services going forward. Iron Mountain Digital President John Clancy, who revealed that former Stratify CEO Ramana Venkata was promoted to chief operating officer a little over a month ago. Bringing three engineering centers in the US and India under Venkata is the first step toward deeper integration between all of Iron Mountain’s data backup, data protection and e-discovery offerings. 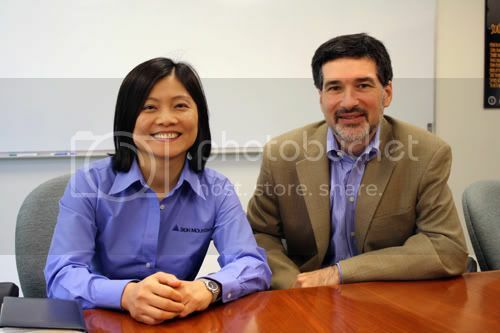 Iron Mountain Digital Data Protection senior product marketing manager Jackie Su and director of product management David Asher, who gave us the scoop on plans to integrate data classification IP from Avalere into Connected, LiveVault and Virtual File Store.